The name derives fron the medioeval Sancta Agatha, christian martyr to whom, on demand of Queen Teodolinda, has been dedicated the churc. 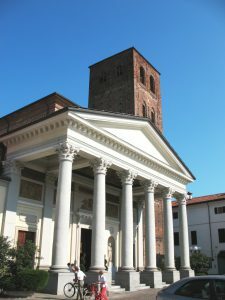 In the central Piazza Roma there is the Town Hall palace having three orders of which the higher ones are characterized by fluted pilasters with lonic capitals. On the right hand of the square there is S. Agata parish church, founded on X century as Collegiata dei Canonici. The Collegiata, flourishing in X - XI century, towards the end of XII century falls in a deep crisis despite Bishop Uguccione donations; however the church withstanteded for many years and had been suppressed only in the Napoleonic Age, in 1806; rebuil in 1829 had been definitively suppressed in 1855. The romanic building had been reconstructed at first in XVI century and then in the current neoclassical shape in 1836 by Giuseppe Talucchi. Ahead of the facade is placed a wide neoclassical pronaos, frescoed with religious scenes by Luigi. Hartman. The interior is divided in three naves by two important colonnades; the vault shows S. Agata glory, fresco by P.E. Morgari (1862); the walls are frescoed by Hartmann and Costa. In the left-hand nave, the third chapel enshrines a valuable polyptyc by Gerolamo Giovenone (1531), divided in ten paintings which represent the Saints of the antiques ministers. Abose S. Lucia, S. Stefano, S. Agata, S. Eusebio, S. Caterina; below, S. Rocco, S. Michele, The Madonna with the Child, S. Giovanni Battista and S. Sebastiano. The statue of S. Agata by Vincenzo Giani (1861) has been finely crafted in the sagrestia of the church can be found beautifully carved wardrobes. Under the presbitery it is possible to visit the cript of S. Stefano, which represent the remains of the ancient romanic church. The space, bare and severe can be dated around the second quarter of the XII century. On the letf-hand side we can see the Baptistry with its square base, painted in 1898 by Bonelli. The bell tower in the late romanesque period (XII century) and the remains of the ancient crenellated walls of the canonic cloister realized in river stones having still traces of flower decorations. (taken fron Santhià Parish Churc web-site). In the heart of the town, the church has a valuable baroque bell tower and gards a wwoden altar having a carved golden elevation which can be attributed to carvers from Biella and dated at the end of XVII century. The composition includes an altar piece of Vercelli school of XVI century showing the Holy Trinity and Saint Apostles Peter and Paul. Church of S. Rocco which was the meeting point for the inhabitants of hamlets Bosafarinera and Romperone, stands on the road towards San Germano, on Via Francigena. The Church of Madonna della Travata stands in the open countryside, towards Tronzano, and it is decorated with ancient frescoes. The ancient little church of San Grato, nowadays deconsecrated, stands in corso Sant'Ignazio fron Santhià; next to it are the new church built in modern style and the San Grato recreation center. 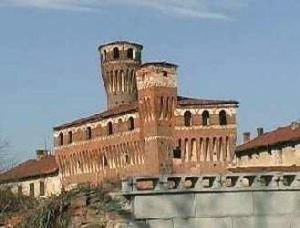 Vettigné Castle is a Vercelli area ancient building of medioeval origin, located in the homonimous hamlet. 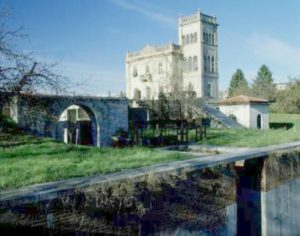 Since the Sixties the castle, following the depopulation of Vettigné hamlet, has been completely neglected. The name Vettigné derives from "vectigal" which is the toll to be paied to obtain the right of passage from the hamlet, which at the time was the crossroad between Via Svizzera and Via Francigena. The Castle has been owned for a long time by the noble family Dal Pozzo and it has been given to the branch Savoia-Aosta after the marriage of Maria Vittoria Carlotta, last heiress of "Principi della Cisterna" with Prince Amedeo, Duke of Aosta and King of Spain. Probably the castle had been erected on a more ancient structure in XV century. It is completely surrounded by dovetail merlons supported by long brackets adorned with an ornamental bar. The quite high cylindrical tower recalls the one of San Genuario Castle, in Crescentino. The houses, the warehouses and the manor house which closed the central court have been built between '500 and '600. According to the legend the bloody captain of fortune Bonifazio called Facino Cane, supposed to be bom in Casale Monferrato, in reality should be naive of Vettigné; that is why Vettigné hemlet and also Santhià have been the only places to be spared by the fury of the captain.